We deliver and haul a variety of materials for any local industry’s project. Spreading services are available as well to distribute all of our materials and save you time, ensuring the spreading is done right. Whether you run a business with a large commercial garden or you need a small amount of garden soil for your home garden, MJP Dump Truck Services has the varieties you need. Choose any amount of chalk, mulch, silt, topsoil, compost, clay, and loam. Our staff will help you choose the right soil product for the plants you’re growing, including types that are versatile enough for any plant species. MJP Dump Truck Services has sand available, made from particles of silica, quartz, and other rocks. With a rough texture, it allows air pockets to form to grow plants that can survive with little moisture. We also have denser sand mixes including pit, river, and sea sand. We’ll deliver sand for use in foundries, glass fibers, gold course bunkers, pool filters, baseball field complexes, and more. When you need to fill in an area with dirt to begin construction, you can rely on MJP Dump Truck Services to deliver any amount you need. Our trucks haul, distribute, and flatten the dirt for any sized area. Made from pea-sized stones, gravel can be laid across the top of a planting bed to improve growing conditions. Gravel expands in heat, protecting and covering an area. Our gravel products can also be applied to gravel service roads, parking lots, flower beds, industrial properties, and patios; available in white, earth tone colors, or a mix of blue, green, and red. Choose from fine or course gravel to fill in small paths and large areas alike. Limestone aggregate keeps areas of land from collapsing underfoot by creating reliable footings and base layers. Limestone is used in several types of construction applications. We have mixes crushed to various gradations, fit for use in the mining, paper, water treatment, masonry, and glass manufacturing industries. 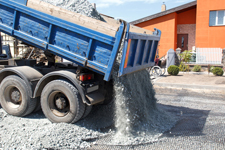 For driveways and patios, we have crushed concrete available. Recycled varieties are also available for a less expensive cost. There are different yard amounts available, from 1 to 20, as well as bags of gravel. Use our crushed concrete as a paver base to support a wide variety of construction projects.